Ben Bruce, the senator representing Bayelsa East in the National Assembly and Chairman of Silverbird Group, has reacted to the death of reggae legend, Ras Kimono. The lawmaker, who expressed sadness at the legend’s death, insisted that Ras Kimono redefined the face of music in Nigeria. Also reacting, economist and entrepreneur, Tony Elumelu, expressed sadness at the death of the reggae legend. 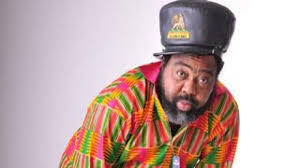 “I just heard the worst news that the Nigerian Reggae legend, and my cousin, #RasKimono has died. Ras had a huge impact on my appreciation of music & is one of the reasons I’m such a huge fan of the genre. I still remember his performance at our #HHchrismas party a two years ago,” he tweeted. The musician passed away on Sunday morning in Lagos. Ras Kimono, who was known for the hit singles ‘Under pressure’ and ‘We no want,’ was scheduled to travel to the United States, on Saturday night, but complained of not feeling too well. He was rushed to a hospital in Ikeja, Lagos, then later taken to another hospital in the Island where he passed on.